Publisher’s note: Lord Mahavir is to Jainism, what Buddha is to Buddhism or Jesus is to Christianity. As a part of our educational programs, at the Center for Pluralism we bring the wisdom of spiritual masters on their resepctive birth celebrations. Sunday, April 9, 2017 is Lord Mahavi’s birthday. These great men and women are the founders of great religions or statesmen, whose wisdom and teachings contribute towards creating a better world for humanity in general. Additionally we are pleased to acknowledge that a part of the definition of pluralism is borrowed from the Jain philosophy of Anekanatavada. Pluralism simply is respecting the otherness of others. Lord Mahavir was the twenty fourth and last Tirthankara (spiritual guide or a Messenger) of the Jain religion of this era. According to Jain philosophy, all Tirthankaras were human beings but they have attained a state of perfection or enlightenment through meditation and self-realization. They are the Gods of Jains. Mahavir was born on the thirteenth day of rising moon of Chaitra month, 599 B.C. in the state of Bihar, India. This day falls in the month of April as per English calendar. His birthday is celebrated as Mahavir Jayanti day. Mahavir was a prince and was given the name Vardhaman by his parents. Being son of a king, he had many worldly pleasures, comforts, and services at his command. But at the age of thirty, he left his family and royal household, gave up his worldly possessions, and become a monk in search of a solution to eliminate pain, sorrow, and sufferings and find permanent happiness. Mahavir spent the next twelve and half years in deep silence and meditation to conquer his desires, feelings, and attachments. He carefully avoided harming or annoying other living beings including animals, birds, and plants. He also went without food for long periods. He was calm and peaceful against all unbearable hardships that he was given the name Mahavir, meaning very brave and courageous. During this period, his spiritual powers fully developed and at the end he realized perfect perception, knowledge, power, and bliss. This realization is known as keval jnana or the perfect enlightenment. Lord Mahavir travelled around India for thirty years preaching to the people the eternal truth he realized. The ultimate objective of his teaching is how one can attain total freedom from the cycle of birth, life, pain, misery, and death, and achieve the permanent blissful state of one’s self. This is also known as liberation, nirvana, absolute freedom, or Moksha. Lord Mahavir explained the interdependent nature of life on earth and the need to live in peace and harmony. Ahimsa or Non-violence and peaceful coexistence was among the key principles in his teachings. These teachings couldn’t be more important today with the rise of violence and terrorism around the world. Live and Let Live was the guiding principle of Jainism under Mahavir and it is a principle that is greatly needed in the world today. As the population of the world continues to increase, we will continue to see tremendous strain on the limited natural resources we have on earth. There is enough for everyone’s need but not enough for everyone’s greed. One of the important teachings of Mahavir was Aparagraha or non possession. By limiting our possessions and consumptions we can reduce the exploitation and destruction of natural resources. Contentment is greatly needed in today’s materialistic world. Jainism teaches that true happiness lies within self and having more materialistic possessions is not the key to happiness. 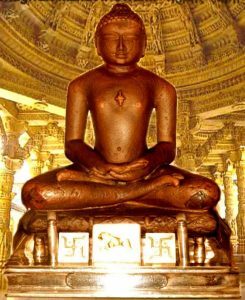 The principle of Anekantvada or non-absolutism is one of the great contributions of Jainism under Mahavir. This theory of pluralism guides us to view and respect viewpoints of others and become a more tolerant society. The multiplicity of viewpoints and freedom of expression are important values that need to be embraced, preserved and protected around the world. The message of Mahavir was the message of peace and non violence. It was a message of tolerance, peaceful coexistence and finding true happiness. If we all embrace and live by his teachings, we could make this world a better place to live for us and generations to come. Anup Pahade is located in Dallas, Texas and serves on the Board of Directors at Jain Society of North Texas.